Between Mother's Day festivities and an anniversary party, Mommy has a super busy weekend planned. 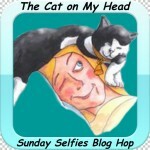 Because I'd like to have a little quality time with her too we decided to do just one blog post this weekend, combining our Caturday Art project with my Mother's Day message/Sunday Selfie. Happy Mother's Day to all the pawsome cat moms out there!!! 1. My favorite cereal is Trader Joe's Pecan Pumpkin Oatmeal. 2. My prom was missing an attendant...me. 3. The best thing about life with Mommy is all the kisses and cuddles. I see your human is a fan of Trader Joe's, like mine is! I love the lilacs today. What purrfect and gorgeous art for your mom, Mudpie. We are wishing her the happiest Mother's Day! We know you'll treat her with lots of extra snuggles, Mudpie. 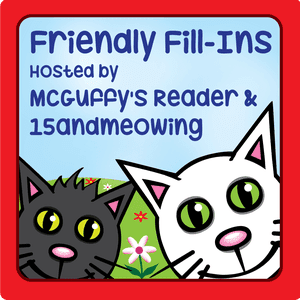 And, fantastic fill-ins! Happy Mother's Day to your mom, Mudpie! You two have a wonderful day together! Aw what a previous gorgeous lilac picture of you for your Mom. We like that you are a cuddly cat & believe it is the best activity ever! Happy weekend to both of you! Beautiful, Mudpie. Happy Mother's Day to your Mommy. 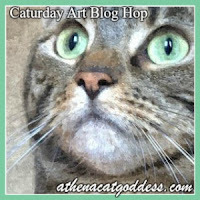 Good job doing lots of hops :) I love your art. And thank you for participating in the fill-ins, great answers. That cereal sounds yummy and proms are waste of money. Miss Mudpie, that would be nice if you welcomed a sister someday. Have a wonderful Mother's Day!!!! Our lilacs are blooming for the first time! It took years, but, there they are! YEA! Mudpie, you were born to be a cat, and you do it well! Go with that. Beautiful art mixing some of TW's fave colors. Happy Mom's day to your mom. 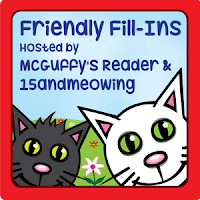 Very nice answers to those questio Purrs fur a wonderful day. Happy Moms day to you, and your Selfie is a floral delight, with you as the brightest bloom! Happy Mother's Day to you wonderful mom! How pretty you look! And I also hope that you'll consider sharing your pretty home with another cat one day. Who knows? You might love it. Beautiful, Mudpie! Lilacs are my favorites! Happy Mother's Day to your awesome Mom! Lilacs are my fav! Great art --happy mom's day! Happy Mother's day to your Mom, dear Mudpie! You have one of the bestest Moms in the world! And thanks fur stopping by to wish us Happy Mother's Day too. Mudpie, you look beautiful! The lilacs are such a pretty touch! Oh my gosh - that picture you entered for Caturday Art is the absolute best ever. It is truly awesome. You always seem to have good ones, but this is the best ever. Hope your human took some time to enjoy Mother's Day. Have a lovely day you two! 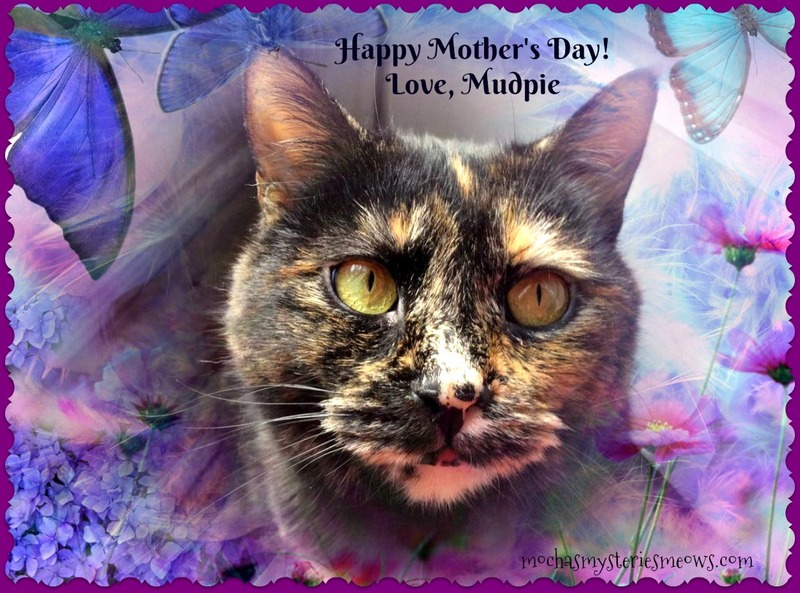 Happy Mother's Day to your wonderful Mama , Mudpie!